Freemasonry universal materialised at Blackpool Masonic Hall when high-ranking Masons from the English, Irish and Scottish constitutions gathered for the installation meeting of Emblem Lodge No 6727 which saw Scotsman Paul Easton install Englishman Martin Spencer into the chair of King Solomon in an outstanding ceremony. 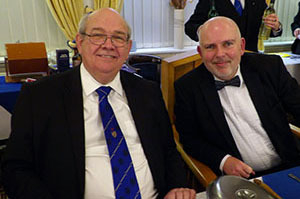 Philip Gunning (left) enjoying the company of new master Martin Spencer. Principal guest, Deputy Provincial Grand Master Philip Gunning was joined by the Grand Master of Ireland Douglas Grey and Grand Director of Music of the Grand Lodge of Scotland James Jack, who is also Past Provincial Grand Master of Lanarkshire. Other highly notable dignitaries in attendance included Assistant Provincial Grand Master Harry Cox, Provincial Grand Master of Mark Masonry Keith Beardmore and fellow grand officers Stuart Thornber, Assistant to the Provincial Grand Principals David Randerson and Blackpool Group Chairman John Turpin. They were supported by acting Provincial grand officers Joe Codling, Philip Houldsworth and Peter Rumley, all kept in order with utmost decorum by Provincial Deputy Grand Director of Ceremonies Mark Barton. Master of the lodge Paul Easton opened the proceedings with alacrity and decisiveness and despite the presence of such an array of highly distinguished brethren, continued in similar vein throughout the ceremony of installing Martin. The nerves of many young Masons would have crumbled under the pressure of so many high ranking dignitaries. Their spines would have turned to blancmange; their tongues would have withered and become immobile. But not so with Paul! He is made of Braveheart material and displayed no nerves. He articulated with crystal clearness and with a precise edge on his speech. Every piece of ritual was beautifully modulated and worthy of any Scottish TV presenter. Pictured from left to right, are: James Henderson, Mark Easton, Paul Easton and Nick Easton. Even an extended period of salutations, there being so numerous a gathering of luminaries, did not nudge Paul off his stride. He kept the lip stiff and upper throughout and made the most of the occasion, as if actually celebrating the stress imposed on him. There was no doubt that Martin was well and truly deposited into the master’s chair and on his part, Martin took to his office like a duck to water. He settled into it with a genial glow. It had been obvious from the beginning that the proletariat was impressed by what they witnessed. Comforting smiles of approbation crept across their faces and approving glances were passed between them. The high standard of ritual was maintained throughout. Of course there were minor hiccups from time to time but nothing that would distract from the pleasure of the performance. Working their way through the various recitals, each performing member of the lodge was a credit to their lodge. Ernie Gavan provided a delightful address to the immediate past master – not the standard explanation of the 47th Problem of Euclid, but an address of a more personal nature. To many of the gathered throng, the true highlight of the ceremony came when the working tools of each degree were recited to perfection. Master Mason James Henderson set the scene with his delivery of the third degree working tools. The whole recital was performed most reverently; a perfect tone on such an auspicious occasion. Following James were Paul Easton’s two sons, Mark and Nick, both of whom are fellow craft Freemasons. They appeared not willing to be out-performed by their father. Mark, in his presentation of the extended version of the second degree tools and Nick, undertaking the recital of the first degree tools, were so scintillating in their narration that they held their audience in a species of trance, combining approbation and respect. It may well have been that, at the moment of delivery, they were suffering from a considerable strain on the old nerves but to the casual observer, they appeared as cool as oysters on ice. During the investiture of the lodge officers, the three installing officers – John Tew as installing senior warden, Ken Buckley as installing junior warden and master of Ashlar Lodge No 5154, William Farrington as installing inner guard – were equally inspired in their addresses to the respective newly-invested officers. Pictured from left to right, are: Ronny Longley, Peter Smith, Ian Smith, Ronald McCarney, James Jack, Douglas Grey, Gordon Smith, Paul Easton, Martin Spencer, Chris Cash, Michael Fisher and George Holden. Indeed, each piece of ritual was a delight to experience. Director of ceremonies Gordon Smith addressed his successor Michael Fisher with sincerity and passion. The address to the deacons by Chris Cash; that to the assistant secretary by Tom Inman and that to the stewards by Warren Plant were all performed to the highest of standards. Blackpool Group Chairman John Turpin also got in on the act with a splendid address to Peter Smith, the lodge’s charity steward, and took the opportunity to present a Masonic Charitable Foundation 2021 Festival Vice Patronage certificate, signifying that the lodge had exceeded £1,500 in donations to the Festival. Continuing the high standard of ritual, Ian Smith delivered a heartfelt address to the newly-installed master, followed by Steve Jelly’s equally genuine address to the wardens. It left only the address to the brethren of the lodge, a duty by tradition reserved for the principal guest. As might be expected of an officer of his experience and stature, Philip Gunning delivered it with consummate sincerity and vim, ensuring that the full significance of the piece was conveyed to his audience. On Paul’s declaration that the installation ceremony had been concluded, Philip conveyed the greetings of the Provincial Grand Master Tony Harrison and congratulated Martin on having attained the chair of King Solomon and Paul on the outstanding manner in which he had conducted the ceremony. He was particularly enthusiastic in his praise of the three young Masons who had delivered the working tools, making a special point of walking to the far west of the lodge room to congratulate each one personally. 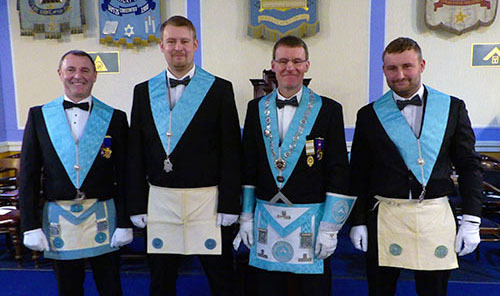 Those honoured by Provincial Grand Lodge, pictured from left to right, are: Gordon Smith, Peter Smith, Tom Inman and Ronny Longley. The excellence of the ceremony was equalled, if not surpassed, by the magnificence of the lodge’s charitable disbursements with a grand total of £12,317.31 being distributed to a diverse range of charities. Particularly notable amounts included £5,000 to Trinity Hospice, £1,500 to the Alzheimer’s Society, £1,932.90 to the Masonic Charitable Foundation 2021 Festival, £500 to the West Lancashire Freemasons’ Charity, £500 to the Blackpool Masonic Club Building Fund, £750 to Blackpool Young Carers, £300 to the Fleetwood Maritime Volunteer Service, £320 to Brian House, £315 to Alder Hey Hospital, £300 to Rosemere Caner Research, £250 to the British Legion, £141.70 to Guide Dogs for the Blind, £100 to North West Air Ambulance and £100 to St Catherine’s Hospice, and smaller sums to a variety of other deserving causes. Philip thanked the brethren of the lodge on behalf of the recipients for their outstanding generosity. There only remained the tradition of the master of the lodge decorating the immediate past master with a past master’s jewel, a duty that Martin eagerly performed on Paul. In pinning it on Paul, Martin commented on the superb manner in which Paul had executed the installation ceremony. There can be no neater way of putting in a nutshell the outcome of the ceremony than to state that it was a triumph for the members of Emblem Lodge and Freemasonry universal in general and it was little wonder that the brethren retired to the lounge bar, and subsequently to the dining suite, in buoyant mood. There were over 100 Masons present at the festive banquet and the celebrations over dinner were exuberant to say the least. Conversation was lively and cheerful and a mood of profound satisfaction prevailed. 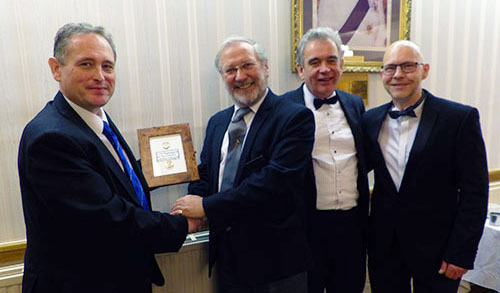 A presentation of a past master’s jewel made to the Grand Master of Ireland Douglas Grey, pictured from left to right, are: Ian Smith, Douglas Grey, Peter Smith and Michael Fisher. Refreshed by good food and genial company, Philip Gunning’s brain was lively and sharp for his response to the toast to the grand officers and he set a trend for relaxed and informal orations at every stage of the speeches that are expected at an installation dinner. Amplifying his earlier remarks, Philip was once again enthusiastic in his praise of all the brethren who had participated in the ceremony. He also congratulated the members of the lodge who had been notified of appointments to Provincial Grand Lodge, and with special emphasis on secretary of the lodge Tom Inman who had been promoted to the very high rank of Past Provincial Senior Grand Warden. In proposing the toast to the new master, Paul Easton revealed that Martin would be celebrating his birthday the following day and outlined many little-known facts about his life. Even members of the lodge were surprised at some of the revelations, including the severe injuries he sustained during a terrorist attack. Thankfully he has also enjoyed less traumatic moments in his complex life. Completing the toast to the master, Peter Bowden belted out the master’s song in splendid style while George Holden cranked up the crochets and semi-quavers with dexterity and gusto on the piano. A surprise element in the proceedings occurred when lodge treasurer Ian Smith and some of his colleagues made a presentation of a lodge past master’s jewel to the Grand Master of Ireland Douglas Grey. In response, Douglas apprised the gathering of the unusual circumstances by which he had met the Emblem Lodge members. While holding a ‘floating’ lodge meeting on the River Shannon, a hoard of English ‘pirates’ boarded the vessel to make enquiries of the purpose of the vessel, having noticed the Masonic flag fluttering on high and having established that a lodge meeting was in progress, the ‘pirates’ informed the crew that they too were Masons. Confirming their credentials, the motley pirates were invited to attend the meeting and a lasting friendship was established. Complicated protocol had prevented Douglas from visiting Emblem Lodge in the past, but thankfully, he and his colleagues were able to attend Martin’s installation meeting. 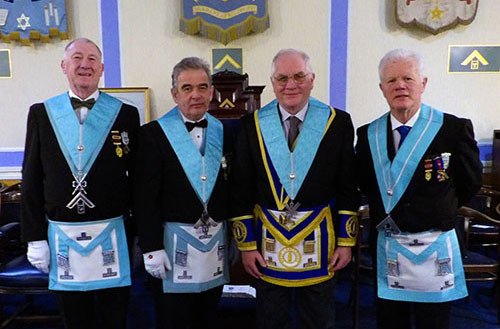 Douglas had brought a party of Irish Masons with him and along with the Scottish contingent assembled by Past Provincial Grand Master for Lanarkshire James Jack, the meeting had established a truly international flavour. And long may it last and flourish! Pictured from left to right, are: Philip Houldsworth, James Jack, Keith Beardmore, David Randerson, Harry Cox, Philip Gunning, Martin Spencer, Paul Easton, Douglas Grey, John Turpin, Peter Rumley and Joe Codling.